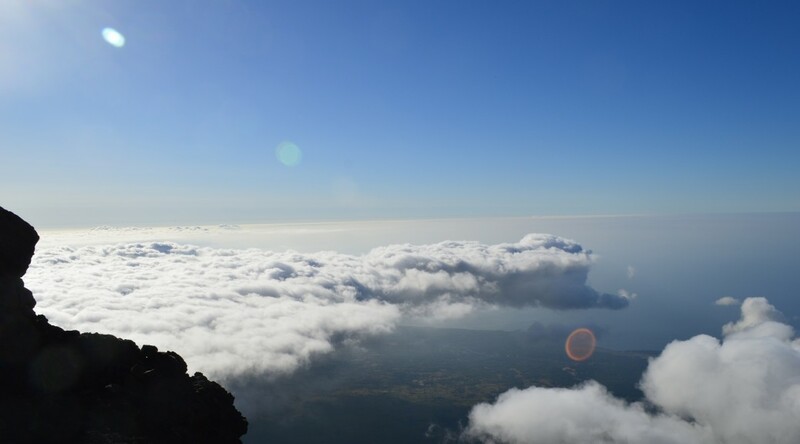 Sometimes our work at the Pico Mountain Observatory is both mentally and physically challenging, but it is always rewarding. Since we arrived almost two weeks ago, the weather has been fairly uncooperative. We had a few days of warm sunshine, kindly reminding us of why we are here, “to sample the air of the marine free troposphere far away from direct emission sources”. 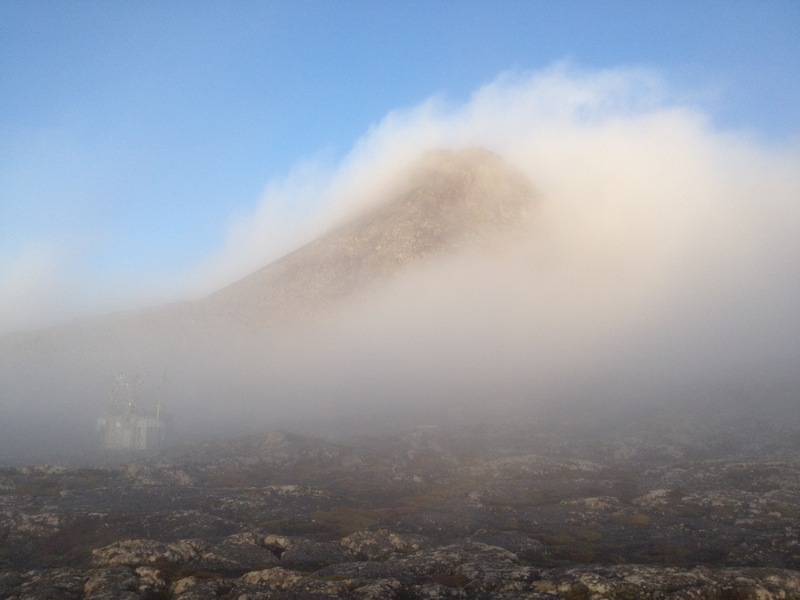 From our previous work at this remote location, we recently published two technical papers about our observations of soot morphology and aerosol chemistry. These technical observations inform the scientific community about the effects of long-range transport on the aerosol mainly from North America. This year’s fieldwork is now underway and just as we picked up some momentum, the weather became difficult to predict. This means, that sometimes we will not be able to do our work upon reaching the Observatory and sometimes traversing up and down the mountain is dangerous and especially so with high winds and rain. This year is particularly special, because we are hosting a guest scientist from Trento Italy, who’s planning to collect some very special mountain profile measurements by carrying several small instruments on his back. Thus, sitting in the apartment and waiting for ideal conditions is absolutely out of the question. This week, we selected a day with the best chance for dry conditions during most of the day and we decided to go for it. By the way, did I mention the mountain hike is quite strenuous with difficult footings even for experienced hikers and we scientists are not mountaineers. When we arrived at the Casa da Montanha to check-in, Isabel warned us the mountain will not likely be very good. Isabel has been working at the Casa da Montanha for many years and she has seen a number of injuries, thus sometimes she is a bit more cautious than we are. Besides on this day, we were anxious to get going to collect our measurements and finish necessary repairs at the observatory and so we said, “ok” and went ahead. We started our hike and then almost immediately hit cool cloudy conditions, which seemed to persist. This was a bit disappointing because the mountain profile measurements are compromised by cloud drops. Luckily for us, the cool cloud appeared to be low on the mountain and so we charged ahead into the sunshine a bit further up. The sunshine and lack of clouds were very inspiring and ideal for the mountain profile measurements. So, we discussed turning on the backpack instrumentation once again. At this moment, a newly married couple from the US overheard us talking and inquired about our pack. They were impressed with our story and so we charged ahead with vigor. The rest of the hike was smooth with clear skies and ample sunshine. 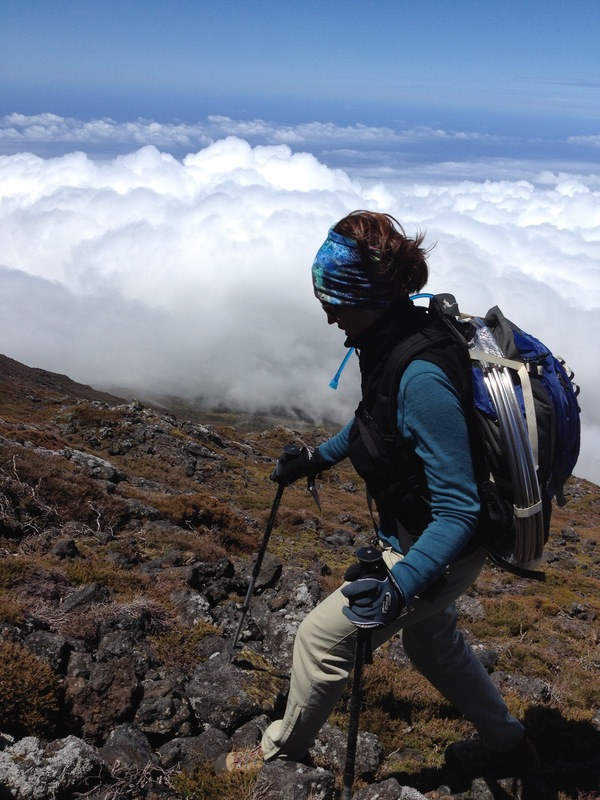 We reached the summit caldera and felt happy to have good weather to do our work. Although a short while later, while I was fully immersed in the electronics of the pesky hi-volume air samplers, the air rapidly cooled and increased in humidity. Then suddenly, it was raining! Because I hadn’t noticed the weather change, all of the electronic boards of my precious high-volume air samplers were exposed to the elements. The effort to put them away and protect them from water takes only about 30 minutes – which feels like a long time in cold wet rain. As I worked, the rain increased and I started to feel really frustrated with the design of the sampler, which seemed excessively unfriendly. To dry out and calm down, I went into the tiny Observatory. It’s a small instrument-dedicated space with lots of sensitive instruments and plenty of obstacles to bump into. My favorite spot is the low ceiling between the two tiny rooms. A view of the Pico Mountain Observatory in the caldera with the Pico “piquinho” (little peak) in the background. After my colleagues finished working outside in the cold wet cloud, we reconvened inside and started talking about the small things to be done inside before leaving. This was disappointing, because we had just recently arrived and didn’t accomplish much yet. Meanwhile, the weather was consistently getting worse, as it sometimes does in mountain environments, and so we knew that it was time to go. We would be cold and wet from the dense cloud in just a short time and we would be hiking down a steep mountain for at least two hours. That’s two or three hours from hot showers, cold beers and tasty Azorean treats. It’s those things that motivate us to get down off the mountain, despite the very unpleasant and sometimes dangerous conditions. To distract our minds from thinking about the weather and all of the things that we didn’t accomplish, we often talk about the new language oddities that we’ve picked up in our recent observations of the locals. Portuguese is an interesting and complicated language, especially for non-latin language speakers. But in the Azores, the words don’t sound at all like they do on Babbel.com. They offer only Brazilian Portuguese and although there are lots of differences between European and Brazilian Portuguese…I suspect there are even more differences between the Azorean and Brazilian Portuguese as well. In most conversations, I get that cute little smile that tells me my effort is appreciated, but perhaps it will be easier for them to speak English with me. This effort to mentally distract myself is very important, because honestly, I’m sometimes feeling insecure with my footings and just enough uncomfortable that I am worried about getting down off the mountain safely. Once down, all is well and we focus on recovery food and drink. Then after the basic human needs are fulfilled, we wonder when will we go back up and how will the weather be. Where is the famous Azores high pressure? That high pressure is optimal for our work for several reasons, including: the warm sunshine & predictable nice days, the good downward transport of long-range transported aerosols form the upper troposphere and the ability to collect aerosol without compromising the instruments or the samples. On the contrary, the low pressure brings wet weather, unpredictable and dangerous storms, upward fluxes of clean lower troposphere air masses and high humidity or suspended droplets that potentially damage our instruments and compromise our samples. After two days of waiting, another potentially good hiking day presents itself. We hiked up slowly, still a bit stressed from the time before. Luckily, the weather was stable and we were able to finish the things we set out to accomplish a few days before and even tackle a few more. The descent on that day was especially good with stable conditions and a good sense of accomplishment.